One of the most common mediums for political art has long been poster making. One of the most common mediums for political art is poster making. From the Mexican Revolution to recent marches infuriated by the Trump administration, posters have continually been used as a powerful form of protest and a symbol of discontent. The skill set used to make posters range from folk art inspired works to slick graphics by professional artists and designers, yet the impact and energy really come from how they are utilized once they leave the artist’s studio. Does the poster empower? Does it call others to arms? In the most successful scenarios, the art is repeated and its message is multiplied as the energy and enthusiasm for the cause escalates to provoke meaningful change. 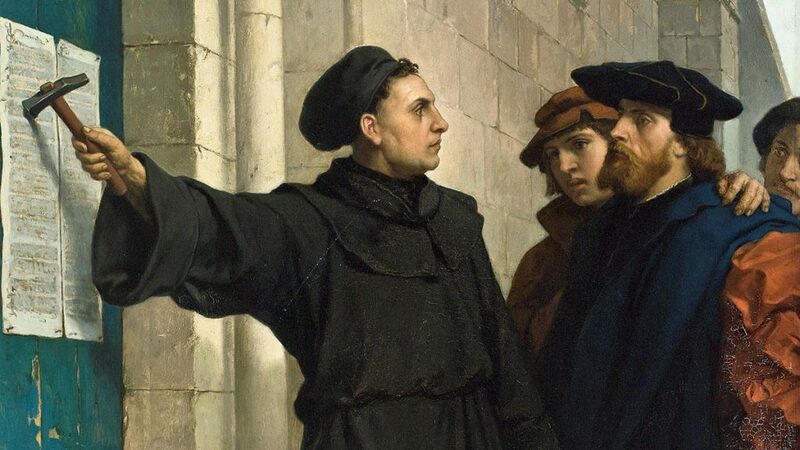 The history of protest posters dates back to the 16th century when Martin Luther and members of the Protestant Reformation posted Luther’s 95 Theses on the church doors. The message communicated a discontent and ultimately provoked a split within the religion. While this interpretation requires some reframing, it’s not hard to imagine how the poster has proven to be a powerful tool to amplify one’s voice in a community. Often anonymous and for a specific moment in time, the shelf life of posters may not be long but the impact (negative or positive) is often received as a harsh criticism or a call to arms depending upon the power structures being challenged. Gentrification is an issue in urban areas around the world and has especially been paramount in major cities in California, making it a common topic of protest posters. The International Hotel in San Francisco was a low-cost residential space that housed 196 elderly Filipino and Chinese individuals in the 1970s. The development of the city’s financial district displaced thousands during the next decade and the hotel was one of the casualties. 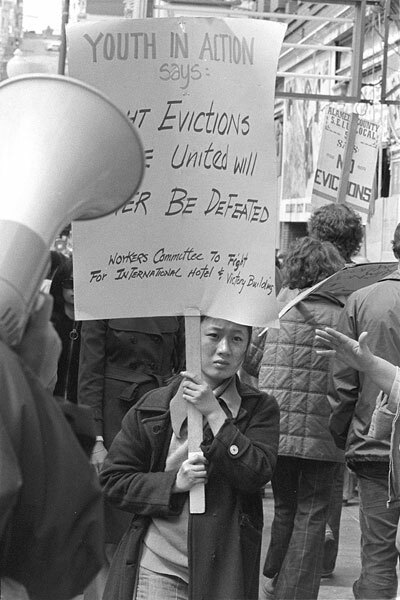 However, the hotel became a rallying cry when Rachel Romero designed a powerful protest poster that argued for the importance of low-income housing using the International Hotel as a visual example of gentrification. An impactful moment, the lot remained empty for years and the city eventually built affordable housing because of the continued activism by residents. An example of a common cause and positive solution, history is filled such examples. As the Iran Contra scandal grew in magnitude during the 1980s, artist Robbie Conal developed guerrilla tactics to post political art in cities around the United States. Enlisting a volunteer guerrilla army, the satirical portraits of politicians like President Ronald Reagan, Secretary of Defense Caspar Weinberger, and Chief of Staff Don Regan were meant to provoke and fight the powerful on an alternative battlefield. Distribution of these posters and the visibility due to repetition was part of the formula for the impact. Designed to disrupt one’s daily routine, the quirky puns and grotesque imagery continue to accomplish these goals. The history of paper is also intimately tied to the history of protest art. While the medium has been available to artists and artisans for centuries, the technological advancements in the 19th century made paper readily available and inexpensive because of steam-driven papermaking machines. It should come as no surprise that Honré Daumier (1808-1879), a French artist became well known for his aesthetic commentary on French political life in the 19th century during this century. Printing his work in a weekly journal, his critiques were received by a wide audience because of the medium and its distributive qualities. As expected, future issues of the journal were censored and circulation challenged by the government. While there have been many artists that used their art to protest like Goya or Daumier, we tend to associated protest posters with significant cultural events. In the 20th century, this typically started with political or social events. From major wars to political battles. It is quite clear that the commonalities and tensions involved in creating protest art to provoke change is nothing new. From local issues like gentrification, racism, police violence, and homelessness to organized resistance, the individuals and groups associated with several of these movements are helpful in diving deeper into the process of creating protest posters and what influences their action. Emory Douglas is most well-known for serving as the Minister of Culture for the Black Panther Party for close to three decades. His art was commonly featured in The Black Panther newspaper and influenced thousands of readers during his tenure. 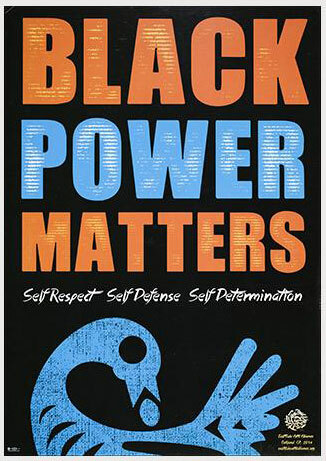 Full of hard-hitting slogans and linear drawings that confronted the viewer with symbols of the revolutionary cause, Douglas’ main role as an art director was to communicate the message of the Black Panther Party and to empower his audience. Douglas’ protest posters were used like weapons to fight for civil rights. The images were so powerful that they were replicated and hung up around the community as encouragement to combat segregation and the unethical treatment of the black population. Giving voice to the voiceless, the collective energy and the repetition of his graphics took on a life of their own and continue to represent these ideas decades later. 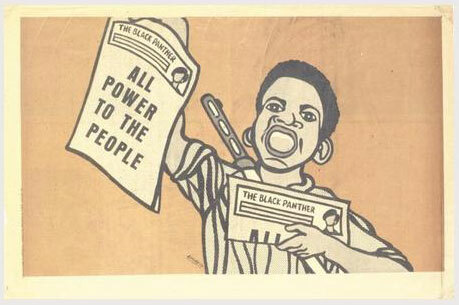 Like the Black Panther Party, organizations can also serve as a source for powerful protest art to blossom. In the 1970s, Carlos Bueno, Antonio Ibáñez and Frank Hernández were important in establishing Self Help Graphics (SHG) in a Los Angeles garage, a group that facilitated the creation and promotion of art by Chicano and Latino artists. From educational offerings to professional workshops, the center was founded to be community centered. Self Help Graphics has been instrumental in fighting gentrification in Los Angeles. 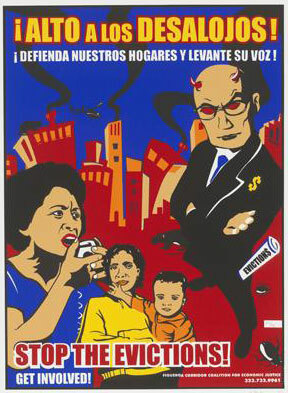 The poster “Community Control of the Land” was designed by Favianna Rodriguez with SHG in 2002 as a rallying cry. The text “¡Alto A Los Desalojos! ¡Defienda Nuestros Hogares Y Levante Su Voz!” and “Stop The Evictions! Get Involved!” is placed over community members who are represented as women (one with a child) while a horned businessman with glowing red eyes stands in opposition with an eviction notice sticking out of his pocket. The powerful image establishes the need to stand up to these developments and even personifies the oppressor as someone who is evil. The artists like Rodriquez associated with SHG started by making protest art that addressed issues of oppression and segregation in their own community. While SHG has experienced the ups and downs of a longstanding organization, it continues to operate under the same ideals. 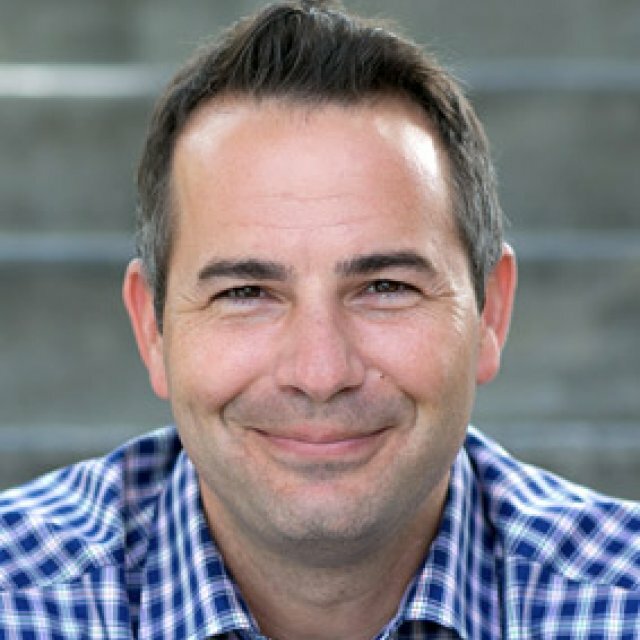 In a similar vein, the EastSide Arts Alliance in Northern California is built upon a diverse group of artists and community organizers from the San Antonio district within the city of Oakland. Advocating for social and progressive change, they often utilize the arts as a defining aspect of social change. Artist Favianna Rodriguez explains that “The EastSide is a continuum of the Black Arts and Chicano Arts cultural movement.” Through public art projects, festivals and town halls, they take on important issues like displacement to build a stronger community. In each example, protest posters have been used to protect, motivate and educate. The powerful disposition and effect that someone like Emory Douglas has had dovetails nicely into the community focused energies that EastSide Arts Alliance and Self Help Graphics have maintained through the years. The words of Nobel Laureate and Holocaust survivor Elie Wiesel ring true:“There may be a time when we are powerless to prevent injustice, but there must never be a time when we fail to protest.” While the internet and social media allow for a great number of voices and perspectives to be heard, there is still an important place for the protest poster in the 21st century. The emotion that is embedded within protest posters is essential as these marks and symbols carry this passion onward far after the creative process to make stronger and more sustainable communities for everyone. Originally published by KCET, Public Media Group of Southern California, 10.17.2017, republished with permission for non-commercial, educational purposes. This entry was posted in Uncategorized and tagged Advertising, Art History, History, Politics, Poster, Protest. Bookmark the permalink.